Herman L. Bennett is a Professor in the Ph. 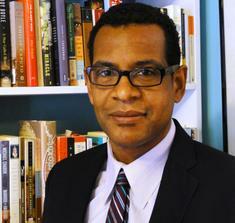 D. Program in History at the Graduate Center, City University of New York (CUNY); he is also a faculty member of the Certificate Program in Africana Studies, American Studies and Renaissance Studies. Previously he was an instructor at the Univ. of North Carolina at Chapel Hill 1992–93; asst. prof. The Johns Hopkins Univ. 1995–97; then at Rutgers—The State Univ. of New Jersey: asst. prof. 1997–2003, Association Prof. 2003–08, prof. 2008–09; and finally Professor at the Graduate Center, CUNY, beginning in 2009. Prior to his academic appointments Professor Bennett earned BA with Highest Honors from the University of North Carolina at Chapel Hill in 1986, his MA (in 1986) and Ph.D from Duke University (1993). searches for ways to assist students and colleagues in seeing themselves as stakeholders so as to negotiate the workings of institutions and cultural formations with the ability to effect change in existing structures. Professor Bennett has been the recipient of numerous scholarly awards including two National Endowment for the Humanities Grants, a Mellon Fellowship in the Humanities, a two-year Mellon Postdoctoral Fellowship at The Johns Hopkins University, an ACLS Burkhardt Fellowship, and Membership at the Institute for Advanced Studies in Princeton. A few years ago he received the American Historical Association Equity Award, awarded for ‘excellence in recruiting and retaining underrepresented racial and ethnic groups into the Historical Profession.’ This academic year he is convening a Mellon Sawyer Seminar: ‘The Cultures & History of Freedom.’ Professor Bennett is the Editor of the Blacks in the Diaspora Series at Indiana University Press, a member of the Editorial board of the University of Florida Presses, a member of the Social Text Editorial Collective and also an editorial board member of the American Historical Review the primer journal of the American Historical profession.